Oskemen, Kazakhstan is playing host to the 2018 Asian Women’s Volleyball Club Championships, which started on July 11th. Only teams who have won the leagues in their respective countries qualify for this continental championship. This year’s field consists of 9 teams, up from 8 last year. Sri Lanka and Indonesia sent teams this year, while the Philippines is absent from this year’s competition. The NEC Red Rockets took the top spot in the playoffs by winning Pool A with a 2-0 record. They opened the tournament on July 12th with a 3-2 victory over Supreme Chonburi of Thailand. They fell to a 0-2 deficit, but rallied back to take the next 3 sets behind 23 points by Nanami Hirose. She led the match with 18 kills and 3 service aces. Mizuki Yanagita was right behind with 18 points from 17 kills. Fatou Diiouck was the only double-digit scorer for Supreme Conburi with 14 points. Both Yanagita and Hirose scored 19 points in their 3-1 win over Zenith Steel Jiangsu of China on July 13th. 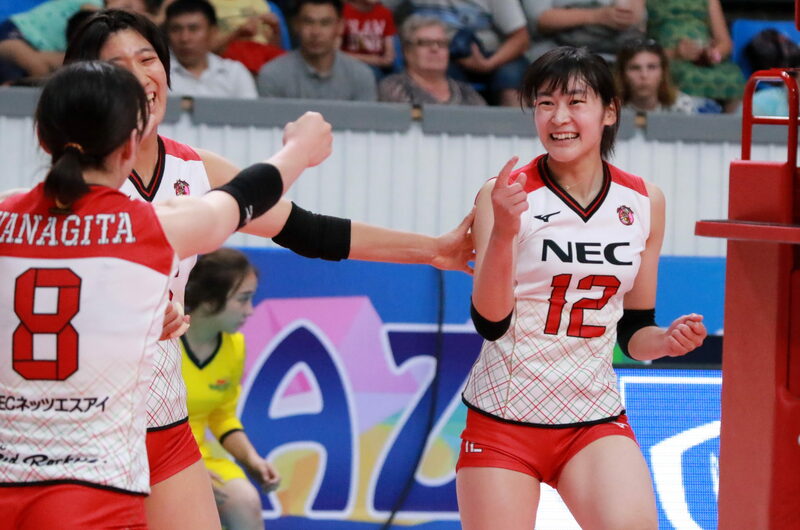 Misaki Yamauchi contributed 17 points for NEC Red Rockets to help them secure the top spot in Pool A. Yenjin Wang led Jiangsu with 17 points on 12 kills and 5 blocks. Chenyue Wang led the match with 6 blocks. Supreme Chonburi started the tournament with a 3-0 sweep over Jiangsu on July 11th. Ajcharaporn Kongyot led Chonburi with 17 points and a match-high 15 kills. Pleumjit Thinkaow followed right behind with 15 points on 10 kills, an ace, and a match-leading 4 blocks. Yenjin Wang was the only player for Jiangsu to score in the more than 10. She finished the match with 11 points in the defeat. Altay of Kazakhstan were the winners of Pool B with a perfect 2-0 record. They beat Paykan Tehran VC on the first day in straight sets. Liudmila Khabibullina led the match with 16 points for Altay. Her points came from 13 kills and 3 blocks. Sana Anarkulovaand Olga Drobyshevskaya both put up 10 points in the win. Esfahani Maedeh Borhani was the leading scorer for Paykan with 12 points. Mahsa Kadkhoda was the second-leading scorer with 8 points. Altay secured first place in Pool B with a 3-1 win over CMFC of Chinese Taipei on July 13th. Drobyshevskaya was the scoring leader for Altay this time with 17 points. Heloiza Pereira matched her with 17 points as well. Anarkulova was right behind both of them with 16 points. The match’s top scorer was Tsu-ya Chen from CMFC. She finished with 18 points on 15 kills, 2 blocks, and 1 ace. Chen scored 17 points a day earlier when CMFC defeated Paykan Tehran VC in 5 sets. This time the team was led by Wei-hua Wu and her 25 points. That was the second-highest point total of any player in tournament pool play. All of her points came from kills. Kadkhoda and Borhani both contributed 21 points each for Paykan, but it was not stay out of the bottom of the pool standings. Garuda VC of Indonesia won the pool by finishing 2-0. On July 12th they beat the Lanka Lions in a convincing 3-0 sweep. Manganang Aprilia Santini led the way for Garuda with 16 points. She posted match-high totals with 13 kills and 2 aces. Nabila Amalia Fajrina scored 13 points while only playing in the 1st and 3rd sets. Kavisha Lakshani Perera scored 10 points for the Lanka Lions, and Apsara Senevirathna chipped in 9 points in the loss. Santini went off for a tournament-high 32 points in a 3-1 win over VTV Bình Điền Long An of Vietnam on July 13th. Not only was that the most points scored in a single match of the tournament thus far, she also had a tournament high 28 kills. She also finished the match with 4 blocks. Salsabila Nandita Ayu was the only other player for Garuda VC to score in the double digits with 10 points. Thi Ngoc Hoa Nguyen put up an impressive 17 points for VTV Bình Điền Long An on 9 kills, 5 blocks, and 3 aces. Thi Thanh Thuy Tran scored 14 points in the loss on 12 kills and 2 blocks. Tran led the way for VTV Bình Điền Long An in their 3-0 win over the Lanka Lions on July 11th. She had 14 points on 10 kills, 1 block, and a match-high 3 service aces. Nguyen also had kills as a part of her 13 points. She also posted a match-high 3 blocks. Kavisah Perera and Thilini Perera both scored 4 points on 4 kills each for the Lanka Lions.